Lays claim to being the first London boutique hotel with David Levin claiming to have coined the term boutique hotel. First opened in 1971 by David Levin. The Capital Hotel was one of the last privately owned 5 star luxury townhouse hotels in central London till being sold in 2017. In 1973 the Capital hotel gained distinction as one of the first three hotels in London to achieve a Michelin Star. The intimate feel of the hotel is created from the moment you arrive to find a welcoming liveried doorman. The exquisite interiors incorporate the work of acclaimed names from the world of British design such as Nina Campbell, and David Linley, nephew of Her Majesty The Queen. The lobby features a real fireplace. All rooms are individually designed with original works of art and an emphasis on refined elegance. Fabrics for many rooms were selected from the Ralph Lauren collection, and each has its own special charm and character. Mattresses are handmade and the sheets are of the finest Egyptian cotton, while consoles by each bed control radio, television and lighting. The marble bathrooms are equipped with a bath and power shower with supplied bathrobes, slippers and toiletries. Other bedroom amenities include individually controlled Air conditioning with in-room controls, Radio, interactive television with satellite channels, PPV and email, Hairdryer, laptop sized safe, tea/coffee facilities, Mini bar. The Capital Hotel guests are even supplied with an umbrella for the unpredictable British weather. All rooms have wireless internet access at an additional cost. All suites and double rooms have super king-size beds. The hotel has 8 suites. The Junior Suites have a traditional decor, extra washroom and seating area with double sofa. Two Bedroom Suites are larger than Junior Suites. Main bedroom has a king sized bed while the second bedroom has twin beds. The suite has two bathrooms, its own kitchen and a private entrance. Room service 24 hours. Evening turndown service. Outlaw's Restaurant: (Replaced Capital Restaurant in 2012) Named after chef Nathan Outlaw. Here the focus is on simply prepared, ecologically sound British seafood from Rock (in Cornwall). Interior designer Nina Campbell has created a sophisticated yet informal space. The huge windows and high ceilings are accentuated by the simplicity of the decor. Natural woods work with shades of teal whilst the elegant place settings on the bare tables hint at the exemplary service and food to come. The menu frequently changes to reflect the best of the day's catch. Dished include everything from from ling to lobster, and typical dishes include Grilled Whole Lemon Sole with parsley, lemon and garlic dressing, Wild Sea Bass Fillet with saffron, cucumber and mussel sauce, and Chargrilled Venison Chop with smoked bacon and hazelnut dressing and roasted squash. Open: Monday-Saturday (closed Sunday), Lunch: Noon - 14.30, dinner: 18.00 - 22.30. The Sitting Room, where one may take morning coffee, afternoon tea and light meals, reflects a traditional country house setting, while the Eaton and Cadogan Rooms are set aside for private dining and business meetings. Afternoon Tea is served daily in the Sitting Room between 3:30pm and 5:30pm. The Capital has two private rooms, seating 12 and 24 which are available for business meetings or special occasions for breakfast, lunch and dinner. The Capital Bar offers a relaxing and elegant setting with a range of drinks including cocktails, cognac, whisky and wines that include Levin Sauvignon Blanc, Levin Rosé and Levin Gamay. Inspired by the famous Harrys Bar in Venice. The decor of shiny nickel, panelled leather and granite lends a glamorous feel. There is wireless internet access throughout the Capital Hotel. There is also a shoe shine service. personal shopper can be requested for Harrods and Harvey Nichols. Business desk for guest assistance. Access to exclusive The Peak health club and gym at the Carlton Tower Hotel just over 100 yards from the hotel. Preferential rates at Urban Retreat Spa at Harrods. Nearest: Tube Station: Knightsbridge 228 yards (208 metres), Railway Station: London Victoria 0.8 miles (1.3 km), DLR Station: Tower Gateway 3.9 miles (6.2 km), Motorway: M4 Junction 1 5.1 miles (8.2 km). The Capital Hotels location is in the heart of one of London's most upmarket areas between Sloane Street and Knightsbridge. The area has an abundance of chic boutiques, restaurants and bars with good access to most of the major attractions within London. This particular district is known as Knightsbridge (A4/A315) which is actually the name of the major road along the south side of Hyde Park and some 250 yards from the hotel. Hyde Park is the major park in central London offering its own Gallery (Serpentine Gallery), snack bars, themed landscaped areas, statues, tennis courts, horse riding and boating on the Serpentine Lake (weather permitting). Harrods department store has become almost synonymous with Knightsbridge. A store with a reputation of a place where you can absolutely anything while being geared to the more wealthily of shoppers. Even so its a place where many tourists go just to say they have been and is something of an attraction in its own right. Just 200 yards from the hotel. Also close by is the famous Harvey Nichols. Other local places of interest include Brompton Oratory (0.3 miles), Apsley House (0.5 miles), Wellington Arch (0.5 miles), Victoria and Albert Museum (0.5 miles), Natural History and Science Museums (0.6 miles), Buckingham Palace (0.9 miles), Westminster Cathedral (1 mile) and Kensington Palace (1.2 miles). Also around 1 mile is the world renowned Kings Road, Chelsea with a host of shopping and other amenities. History: Bought by USA based Warwick Hotels and Resorts in January 2017. 11 Cadogan Gardens: is 0.5 miles (0.8 km) away, has a guest satisfaction score of 89% and rates start from about £263. Ampersand Hotel: is 0.7 miles (1.1 km) from here, earns a customer rating of 90% and base rates begin at about £192. Flemings Hotel Mayfair And Apartments: 0.8 miles (1.3 km), rated at 89% and with rates from around £180. St James Hotel And Club Mayfair: 1.0 miles (1.6 km), rated at 89% and with rates from around £289. Milesfaster ranking: 187th from 866 London hotels, 4th of 9 Small Luxury Hotels, and 80th of 131 five star rated hotels. Another to Consider: Another hotel that is much like the Capital Hotel and not too far (0.4 miles, 0.6 km) would be the 5 star Threadneedles, Autograph Collection, where prices begin from around £189 and which has a 90% guest satisfaction rating. The Threadneedles, Autograph Collection also offers: free WiFi. 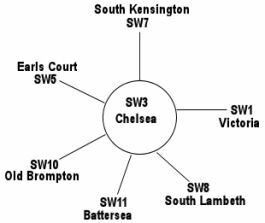 The 50 hotels nearest to this location (Basil Street, SW3 postcode) that we list cover a 0.8 miles (1.3 km) radius. They breakdown as follows: 34 five star hotels (average rating 90%), 12 four star hotels (average rating 81%) and 4 three star hotels (average rating 65%). Overall the best rated hotels is 41 Hotel (5 star) at 100%. Of the 50 closest hotels analysed we have base rate data for 49 of them. The average starting rate looking at all the nearest hotels to this location is £303 per night. The cheapest standard rates begin at £67 at Tophams Hotel Belgravia (3 Star, 54%) while the highest base rates are £1000 at 45 Park Lane Hotel (5 Star, 98%). Averages listed for each individual star sector: Five Star average: £368, Four Star average: £166 and Three Star average: £89. We use a proprietary algorithm to rank hotels based on user reviews but adjusting for contributing factors. We rank Capital Hotel 20th (joint) of the 50 local hotels and 19th (joint) for the 34 five star hotels in the area. Our ranking for sheer lowest base rates is 24th of 49 (8th of 33 five star hotels.). To give an overall ranking compared to hotels nearby we combine the rating and base rate scores which gives this hotel a ranking of 15th of 45 for sheer bang for buck (Egerton House Hotel was top). Outlaw's restaurant winner of Best Value Set Lunch Award in the UK by Waitrose Good Food Guide 2014. The Good Hotel Guide Cesar Award 2008 "London Hotel of the Year"
2007/2008: Bronze award for best small hotel.